Whether you are playing tackle football or flag football your choice of the best football cleats matter. Huddle up as we take an in-depth look at some of the top cleats on the market for skill positions to the beasts in the trenches. You will also find an overview of the various types of cleat available from low, mid and high-top design and a dig deep into some of the best brands of football shoes, aka cleats, around. You’ll also notice we’ve mentioned one pair to avoid, because wasting money is as frustrating as a turnover. Review this guide and take your version of the game — tackle or flag football — to the next level with the ultimate pair of football cleats on your feet. How to Clean Football Cleats: Cool Trick! Men’s Nike Vapor Speed Low TD Football Cleat Review – Best Football Cleats for Speed: Nike has a reputation for developing excellent cleats regardless of the sport and these Vapor Speed Lows are no exception to that standard. The key is the synthetic-and-leather upper that provides comfort and protection, while maintaining a lightweight shell for the cleat. It is this lightweight material that makes these the best football cleats for speed as you barely know you are wearing them when tearing down the field to score a touchdown. The other biggest asset of these cleats for football is a sole plate that allows the wearer to cut on a dime. Even slower footed players will feel like Dante Hall in his prime when cutting up defenders in these cleats. Men’s Nike Vapor Shark 2 Football Cleat Review – Best Flag Football Cleats: The requirements for the best flag football cleats are pretty simple. You do not necessarily need football spikes that will be most effective in contact, because with the exception of leagues that allow contact at the line of scrimmage, the risk of serious contact in the game is minimal. With that out of the way it is all about weight and grip. These Nike Vapor Shark 2 cleats are ideal for flag football players because of the strategically placed cleats that use Nike’s Fast Flex technology. The cleats are cushioned enough to be comfortable, without all that extra padding that can weigh the cleat down. Wearing these cleats, which are good on turf and other surfaces often used for flag, will give you that needed edge over the competition. 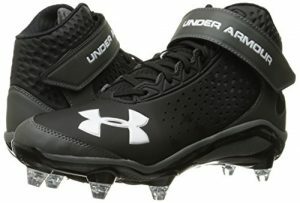 Under Armour Crusher – Best wide football cleats: When looking for wide cleats it is best to stay away from Nike entirely. The company makes great cleats for all its sports, but you have to have the feet of a ballerina to be able to wear them without some serious work put in to stretch and widen their seams. Adidas is a little better, but even they seem to cater their cleats toward those with narrower feet. That leaves Under Armour Crusher as the other main player in the game and their cleats tend to be better for wider footed players. These Crushers in particular have a wide enough toe box that those with even the flattest feet will find comfort. It doesn’t hurt that these cleats are also ideal for a wide range of football positions and they can be used on turf and grass. That combination makes these some of the best wide football cleats on the market. Nike Vapor Untouchable – Best football cleats for wide receiver: The Nike Vapor Untouchable cleats have an ideal name for cleats designed for those flyers outside on offense. That is why these are some of the best football cleats for wide receivers on the market today. These cleats are designed for top end speed, the kind of straight line blur that you see playing in the NFL. To reach this the company has combined their Flyknit technology with a sole plate that is less concerned with the ability to cut and more focused on acceleration off of the mark. The result is a lightweight cleat, with an ankle sock for better fit, that is among the best cleats out there for turning your stride pattern into pure speed down the field. Adidas Performance Filthyspeed Low – Best football cleats for running backs: These Adidas Filthyspeed lows are among the best football cleats for running backs because of their style, their construction and their feel on the foot. These cleats are new school in their looks but old school in their design, moving away from the molded and bladed cleats you find today and instead going with a seven detachable stud soulplate. The advantage of playing with studs like this will be obvious as soon as you hit the (grass) field and the increase in grip and ability to cut is off of the charts. If your flag football league plays on grass then you need to get these cleats to beat defenders with the ball and also to get in and out of your cuts and breaks faster when going out to catch a pass or run after the grab for YAC. Under Armour Renegade D – Best football cleats for linemen: Linemen cleats need to be strong, tough and rugged. These Renegade D cleats from Under Armour fit the bill and they are among the best football cleats for linemen that you will find. One thing that all linemen will agree on is that the positions in the trenches call for high top cleats to avoid being rolled up on by other linemen. This makes high-top spikes essentially a requirement if you do not want your ankles to be destroyed within a couple of weeks of the start of your 2019 Winter season. These cleats feature that high top design, with the added feature of a lock down ankle strap that only adds to the stability of the cleat. As a lineman you want your foot to be nothing more than an extension of your leg, locked in place and with just enough movement to keep things comfortable. That is exactly the fit that this cleat provides with molded foam making the foot comfortable while the ankle is locked in. Nike Alpha Pro TD – best football cleats for linebackers: The Nike Alpha Pro is one of the best football cleats for linebackers because they are designed for those who play on the edges like linebackers and running backs. This football cleat combines Flywire technology, which gives a dynamic and glove-like fit, with a reinforced toe bumper for additional durability and protection. 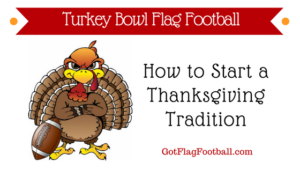 This is especially important for those players rushing and attacking from the edges as they have to be able to trust their cleats for dynamic and swift movement, but also know that they will be protected if their toes are trampled by a lumbering lineman. The sole plate is set up to provide excellent traction when rushing the passer, especially during sudden cuts, starts and stops. 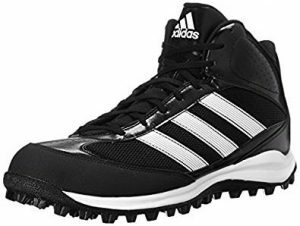 Adidas Performance Turf Hog LX Mid – Best indoor football cleats: When looking for an ideal indoor or turf cleat it is usually best to veer towards mid-cut cleats. High tops tend to be too easy to get stuck in the turf and cause lower leg damage, while low tops offer no ankle support at all and rolling an ankle is far too easy. That is why these Turf Hog LX Mids by Adidas are the best indoor football cleats around. The cleats are breathable for comfort, but the main benefit is the grip on the sole of the cleat where the football spikes are specifically designed for turf and indoor use. Many people use firm ground soccer cleats to play on turf, but they are not going to stand up to the pounding and the seams can burst quickly around the base of the shoe. Get some mids like this and take over your league. Under Armour Highlight MC – Best high top football cleats: This synthetic cleat is ideal for those who like a little more cushioning and support in their football cleats. That is why they are among the best high top football cleats on the market today. The cleat features UA ClutchFit technology, creating a second skin that molds to the ankle when you are running and gives powerful support. This extra feel is something you can only get with high tops and the extra level of stability that is provided really makes a player feel like they have extra drive and push, with a much lower chance of injury to the always vulnerable ankle joint. Adidas AdiZero 5-Star 5.0 – Best all white football cleats: While most people will pick their cleat based on their position or style of play, there are always going to be a few players who care far more about style than function. Among those are the players who see all-black football cleats as being far too common and instead they want to go the other way with an all-white design. Those people could do far worse than taking a look at the Adidas AdiZero 5-Star 5.0 football cleats. They come in a number of color ways, but one is an all-white number that is so bright that it might just work to your advantage by blinding your opponent. 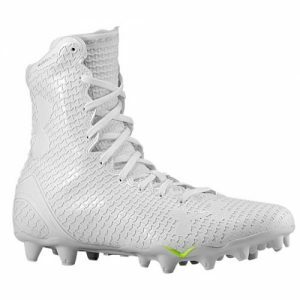 At the very worst these are the best all white football cleats on the market when you combine style with function as the AdiZeros hit that sweet spot between strength and lightweight that companies strive for. Reebok Pro Burner Speed Mid SD3 – One to avoid: These cleats from Reebok look good, and they are decently wide which will please fans that are sick of the narrow Nike cleats, but that is where the news ends. It seems like these cleats are not made to the same standard as many others, with cheap materials that are easily damaged causing them to be one to avoid in the crowded football cleat market. The front cleat plate has been noted to separate from the rest of the shoe after as little as a couple of uses. This means that is is hard to see a pair of these cleats lasting a full season, no matter the level at which they are worn. Nike: Nike football cleats are well engineered and have the power of one of the biggest sportswear manufacturers in the world behind them. Their cleats run from high top, through mid-top, to low top, and their cleats seem to value speed and lightweight materials (in general) over anything else. This actually ties in with the brand ethos as a whole and if you can imagine the Oregon Ducks football program condensed into cleat form it is what Nike tries to go for with each and every new release. As a result Nike cleats are popular around the country from rec leagues to the NFL and with flag football players often valuing their styling and responsiveness on the ground. Under Armour: If crazy patterns and styles are your thing, then make sure to check out some Under Armour cleats before settling on your next pair. Be it their high tops, their mid tops, or their low cur football cleats, Under Armour has made sure that the flashy look is no longer just for wide receivers who want to stand out on the field. In today’s world even your starting center can be rocking cleats in a variety of crazy patterns. It is important to know though that UA cleats are not all about looks. Their football spikes are well developed, durable and they have different designs and technologies to fit with all position groups and play styles. Adidas: Adidas has been making cleats for years, with their soccer cleats being some of the best-selling in the world. As the technology between the two sports in terms of footwear is so similar, it makes sense that the German company would also be one of the best manufacturers of football cleats out there today. Adidas cleats tend not to be as flashy and eye-catching as those produced by Nike and Under Armour, but there is a quiet confidence around those who play in Adidas cleats. They do not need to have their feet show them off as they do all their talking with their game. This is reflected in the performance of the cleats that are always specifically designed to match a position and tend to be more hardwearing and durable than those of their competitors. It could be argued that the most important piece of football equipment, other than football gloves, you will buy are your cleats. Of course, you can’t play the game without a football, and if you’re playing tackle, the pads and the helmets matter, but there is something about the individuality of a good pair of cleats that set them apart. It is important when buying football cleats to focus on what you are looking for. If you play your home games on turf it would make no sense to buy a cleat that is focused for best performance on natural grass. Stick within your budget, do some research and come out with the best cleat for your money. Use: You have to consider the use when buying a new pair of cleats. Are you going to be using these cleats on grass or on turf? Are you a lineman who needs support in the lower leg or are you a wide receiver who needs to be able to get in and out of breaks quickly? The use of the cleat will be the first step in deciding which football cleats are for you. Fit: You have to have football cleats that fit correctly. This means that the cleat must be snug without being tight on the toes, the width must be right to prevent discomfort while playing, and that the cleat must be tight enough on the heel to prevent blisters. An ill-fitting cleat will ruin your game before it even begins. Cost: Know what you want to pay for your cleats before you start searching. Low end cleats can be bought for under $50 (and even less for older models). The newest hotness, however, can often run to over $200. 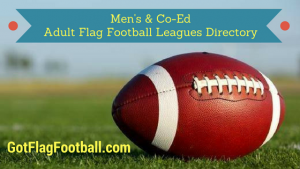 If you are a more of a recreational flag football player than a competitive tackle or flag football player, you may not need the highest priced, most hi-tech cleats out there. We have mentioned earlier in this article that football cleats can come in three very distinct styles. In this section we will look at the differences and strengths of the three types of cleat so you can make a more informed decision when you are ready to buy. Knowledge is power when it comes to buying the best football cleat for flag football or tackle in 2019. Low: The advantage of low-cut shoes is that they are lightweight and much more conducive to cutting and juking for fast, athletic players. These cleats also give the wearer much more maneuverability than the other two styles of football cleat, allowing for fast, dynamic movements on the field to beat defenders and go in to score. The drawback of these cleats is that they have much less support and protection than the other types of cleat and that often the stud pattern is conducive more to hard ground and turf, while they are leff effective on muddy and soggy days. Mid: Mid-cut shoes aim to be the perfect middle ground between the two other types of cleat. They offer far more support than the low-cut shoes, but have higher levels of maneuverability than the high-tops. These shoes are the most varied of the bunch as mid-cut football cleats can lean one way or the other depending on a few different technologies within the shoe. This versatility lends mid-top cleats to skill positions such as quarterbacks and running backs on offense or defensive backs or linebackers on defense. High top: High-top football cleats are the armor pieces of the football cleat world. They extend all the way up to the ankle, providing massive extra support and locking that joint in place. The result is a leg continuation that greatly reduces the chance of a rolled ankle or other such injury. The flip side is that dynamic movement and cutting is almost impossible in these cleats. They are built mainly for linemen who move from side to side with contact that puts massive stress on the ankles. This buyer’s guide to football cleats should now have you all set when it comes to which football spikes to get out before or during your next season. It is a confusing market to walk into without any direction, so hopefully this will have at least given you a head start in the process. We gave you ten different football cleats to buy depending on what you were looking for, while also pointing out on that you should avoid. The guide also went over three of the top brands out there and explained the differences between the different cuts of cleats that are available today. Armed with this information it is going to be much easier to find what you are looking for to take your game to the next level. The right cleats really do make a difference and it is important to make sure your footwear will enhance your level of play and not detract from it.